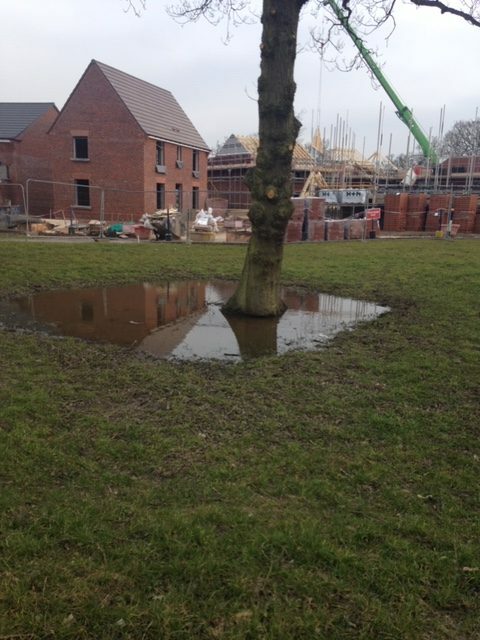 For more than 2 years the Parish Council have been concerned about 5 mature oak trees on the David Wilson site – the attached picture of one of the trees was brought to the attention of the SMBC Tree Officer in March 2016 – the trees were effectively being allowed to drown and die. The adoption process by SMBC has now brought this to the fore and, unfortunately, 2 of the trees have been so badly damaged during the construction of the new development that they are dying due to water damage and are now earmarked for felling. The other 3 will be seasonally dead wooded to encourage new healthy growth. David Wilson have been requested to replace the 2 trees to be felled with semi mature oaks – which should establish a surface root system, and so would not be suffocated in the same way. SMBC have warned David Wilson that they may have to provide semi mature replacements for all 5 trees if necessary. It is very unfortunate that this has been allowed to happen. The Parish Council will be monitoring the situation in order to make sure that the replacement oaks are planted.